Can it be left unchecked??? Does it really exist??? 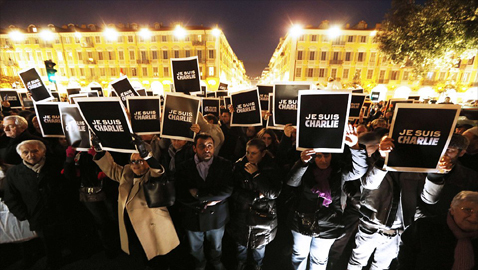 Has Charlie Hebdo and Co. expressing THE Peak of Civilization OR Worst tide of Human Values? As a reaction to the Paris attacks on Charlie Hebdo’s office on 7th January, 2015; the paper again published blasphemous images of our beloved Prophet (S.A.W.) on 14th January, 2015 in response to all of this today we see anger, protests and opposition against this in the whole Muslim world. Charlie Hebdo did this in the name of freedom of speech and we see alot of people supporting this thinking. However, living in such a modern age, I think everyone would question rationale and logic behind this irresponsible and disrespectful freedom of speech. Can “Freedom of Speech” be left unrestrained??? This kind of “Freedom of Speech” should really be rephrased as “Freedom of Hate” because this does not mean anything except spreading uneasiness among others. Knowingly that Prophet (S.A.W) is such a Noble role model for Muslims; what sanity is this to target the emotions of such a huge population of the world? What sort of Freedom is this which allows you to provoke about 25% of the world’s population whenever you want? Everything in the World be it the working of this Universe, evolving human breed, any good social system, any machinery or the inter-relation of all these elements; all have immense discipline and certain boundaries attached to them. We have also seen the destructive results of undue interference in these systems. Freedom of speech/expression; like any other thing in the world society; have limitations. I strongly believe that our words and actions in world society must not provoke hate towards certain communities. How can you hurt someone’s sacred emotions in the name of this freedom? Is this what we have achieved in the long journey of mankind??? “Freedom for the Powerful” is another good alternative name I would suggest for such Freedom of Speech. We see captivated lands of Kashmir andPalestine and the condition of UN resolutions on these issues. The powerful countries use their powers to stop anything going in favor of these issues. Why these big guns can not allow (and support) these captivated people to express and achieve their desires of freedom? We saw the deleted post of Hamza Ali Abbasi from facebook on this Issue and then the stream of debate on that post related to Freedom of Expression. Hamza bro, you most rightly exposed Gaps in facebook and their dual standards. Bravo! honestly, true freedom of speech does not exist today. It’s just a fashion (or tool) used by the liberals/powerful to pave their interests. And Yes…Blood also has Class Difference! More than 40 head of states visited France to show their solidarity with French people. Worthy to mention this was the biggest million march in the history of France carrying people from all religions and nationalities. However, it’s an utmost irony that these people did not reacted to even half an extent when there were sabotage attacks in Pakistan targeting our religious and national trademarks, Malaysian plane disappearance/crash, when Freedom flotilla got attacked OR when Muslims were massacred in India and Myanmar. So, what is the difference between French blood and others? This is a big shame for this so called developed and civilized world. You gathered in Unity with France? Who will stand in Unity for the halted emotions of 1.6 Billion Muslims? Why you kept quiet when blasphemous images were first published, why this satirical paper was not regularized at that time? Why it can not be held accountable now??? Also our media can carry out such programs in which the true image of Islam is depicted. The need to time is to clarify the misconceptions about Islam in the minds of people specially relating to the Western world who think Islam is something like ISIS and TTP. Realize your duty in these times; this will be a great Jihad against the hypocritical media around the world trying to corner out Muslims.